Even if you've never listened to an audiobook before, now is the perfect time to try one. 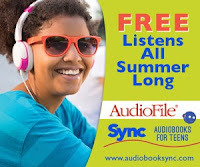 Audiobooksync.com is offering two free titles for download every week through mid-August. New audiobooks are posted every Thursday, and there's a whole lineup of exciting titles coming over the next few months. Head over there today and start planning your summer listening!